We are sure you have heard that kids should get at least an hour of physical activity a day, whether that is in the form of after-school activities, playing outside with friends, or playing street hockey with the family. But in a WebMD article, they mention a survey that found about 74 percent of kids from the ages five to 10 are not getting enough physical activity a day. This article mentions that kids are getting less physical activity for many different reasons, including parents trying to save money on extracurricular activities, technology replacing active play, and the television becoming a family activity. These reasons should not be getting in the way of physical activity and they definitely shouldn’t be an excuse for your children not staying active. Active play can be completely free. Playing outside is an easy way for your children to get the right amount of physical activity each day. Have them go out and play before dinner, take them to the park or beach on weekends, and get them moving. If playing outside during Florida summers is too hot for the kiddos, there are other options. Jumpin’ Jamboree is a fun place for your kids to get the physical activity they need daily. Our indoor jumping playground allows kids to run, slide, bouncy, race, and play until they drop! This is a place that can truly get your child excited about active play and help them get their daily dose of activity. Physical activity is not just important to help your kids drain some of their endless energy, it can help kids (and adults) both physically and cognitively. For kids, exercise and physical activity are better described as active play. 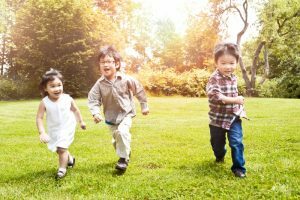 Kids can get their daily activity from recess, gym class, playing in the yard, soccer practice, riding a bike, and anything else that gets them moving. But why is exercise so important for children? Not only can exercising as kids lead to exercising as adults, but it can also help strengthen kids bones, joints, and muscles. According to New Heights, kids who stay active on a regular basis can develop healthy habits that they will carry throughout their lives. Which leads to an overall healthier lifestyle and fewer health issues. Active play can help promote healthy sleeping patterns, allowing your kids to have an improved quality and quantity of sleep. Exercise can also help their cardiovascular health, minimize the risk of becoming overweight, and promote healthy growth and development. According to Healthy Kids and Kids Health, regular physical activity can help decrease the risk of getting type 2 diabetes, heart disease, liver disease, and high cholesterol and blood pressure. These health benefits can greatly improve a person’s life. Kids who stay active well into adulthood can improve their overall health. Studies have shown a link between exercise and positive mental health and cognitive development. Kids can benefit greatly from this link, allowing them to have a better outlook on life and a greater self-esteem. In the New Heights article, they discuss that kids who get enough exercise show fewer symptoms of depression and anxiety. The Healthy Kids article also mentions that physical activity can help reduce levels of stress. Team sports, extracurricular activities, and playing outside with friends can also allow kids to feel a sense of belonging and help them develop interpersonal skills. A ccording to Peak Fitness, keeping kids active at school can help increase their focus, learning, and test results. 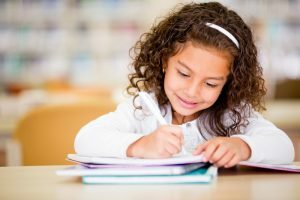 When kids are active, they can focus on other tasks without being restless and are able to perform school work more effectively. Even with studies that show the positive correlation between exercise and kids school performance, there are schools that are removing their physical education programs. Meaning it is more important that you stress the importance of staying active to your kids. More physical activity can improve a child’s life in many ways, from keeping them physically and mentally healthy to keeping them focused during school. It is important for parents to realize this importance and work towards getting your kids the right amount of active play every day. You do not need to sign them up for extracurricular activities to get them the exercise they need. Play basketball with them, go swimming at the beach, ride your bike to the park and play for a while, invest in a trampoline so your kids can have all kinds of jumping and bouncing fun! Or take them to Jumpin’ Jamboree! Jumpin’ Jamboree is the perfect place to take your kids during the hot summer days. Our indoor jumping playground will have your children having fun and getting all the physical activity they need! Have hours of bouncing fun in our giant inflatable bounce houses, your kids will thank you! Don’t let your kids sit inside watching television for the entire summer, get them out and about and stop by Jumpin’ Jamboree! Contact us today to learn more about our facilities, located in Kendall and Doral.